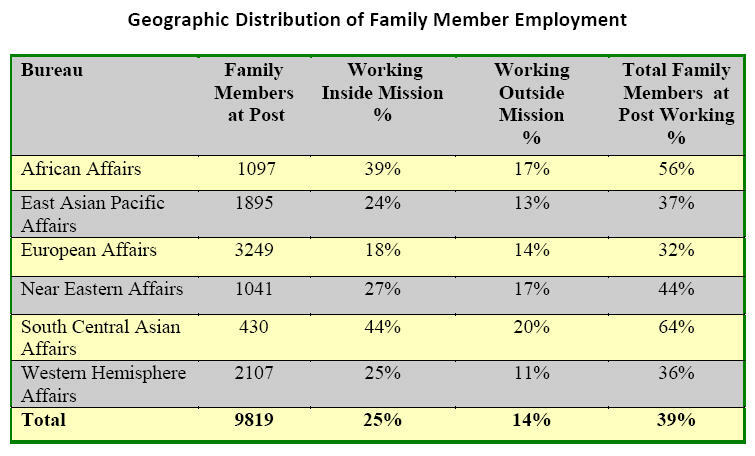 Below is the overall ranking by geographic bureau with the percentage of family members working inside US missions as well as those working in the local economy and the self-employed. You will note that except for the switch between EAP (#4) and WHA (#5), the ranking below is identical to the working inside the mission ranking above. 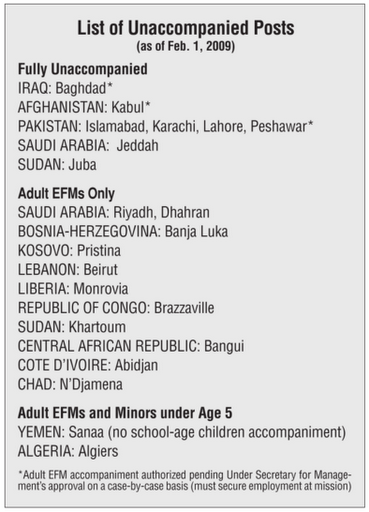 The interesting thing is that the South Central Asian (SCA) bureau (covering Afghanistan*, Bangladesh, Bhutan, India, Kyrgyzstan, Kazakhstan, Maldives, Nepal, Pakistan*, Sri Lanka, Tajikistan, Turkmenistan, and Uzbekistan) has the lowest number of family members present at posts (430 individuals) but has the highest rate of employment. On SCA, although not all family members get to accompany their employee-spouses to posts, almost half of those that get to go, are able to work within the mission (44%) or in the local economy (20%). The most numbers of family members (3,249) according to current data are located in European and Eurasian posts — at some 30 countries from Albania to the Ukraine. But the EUR bureau has the lowest percentage of employment both inside US missions (18%) and outside (local economy employment is at 14%). Part of this may have to do with language barriers, preference for hiring EU nationals in EU countries, bilateral work agreement restrictions, etc. I can’t say for sure. What is clear is if you are heading to a European post, you can expect two things: 1) high standard of living in a good number of posts (also often expensive); and 2) over 2/3 of overall family members will be unemployed during the tour. I guess in real terms that means — family members will have time to hang around and have coffee, except that having coffee will be too expensive a past time for many.